Prototype: E 554 “Eilzug” / “Fast Passenger Train” Münster – Lünen – Dortmund – Essen-Altenessen – Düsseldorf – Colognen – Gerolstein – Trier – Saarbrücken. This “Eilzug” / “Fast Passenger Train” consists of a type D4ü “Hechtwagen” / “Pike Cars” baggage car, a type A4üe “Hechtwagen” / “Pike Cars” passenger car, 1st class, a B4üwe “Schürzenwagen” / “Skirted Car” passenger car, 2nd class, and two type B4n “Silberlinge” / “Silver Coins” passenger cars, 2nd class. The cars look as they did in the winter of 1964/65. Model: Hechtwagen / Pike Cars: The cars are constructed with many details and come in the full length for the scale. The underbodies are specific to the cars. The cars are made to look as they did in Era III with a chrome oxide green paint scheme. The trucks on the baggage car are specific to that car and the swan neck trucks are specific to the passenger cars. The 7319 current-conducting coupling or the 72020/72021 current-conducting coupler, the 73400/73401 (2 per car) lighting kit and the 73404 pickup shoe can be installed in the cars. Schurzenwagen / Skirted Car: This car comes in the full length for the scale. The car is made to look as it did in Era III with a chrome oxide green paint scheme. The 7319 current-conducting coupling or the 72020/72021 current-conducting coupler, and the 73150 lighting kit can be installed in the car. Silberlinge / Silver Coins cars: These cars have the new longer length. The underbodies are specific to the cars. The cars have a white aluminum/black paint scheme. The trucks have brake shoes. The 7319 current-conducting coupling or the 72020/72021 current-conducting coupler, the 73406 pickup shoe, and the 73400/73401 (2 per car) lighting kit, and the 73409 marker light kit can be installed in the cars. Total length over the buffers 126.1 cm / 49-5/8. DC wheel set per car 4 x 700580. Reproduction of an authentic Era III Eilzug. Appropriate motive power for an Eilzug is the class 39 passenger steam locomotive (Insider model for 2009). Completely new tooling for the Hechtwagen / Pike Car family. The 42269 car set is being produced in 2009 in a one-time series only for Insider members. Great Hechte / Pike in the Eilzug / Fast Passenger Train. The Eilzug / Fast Passenger Train concept introduced in 1902 in Bavaria designated as a rule a fast train run over medium distances with few, short stops at the most important stations. Over the years it was customary to use older express train passenger cars in Eilzug trains, hence the use of the Hechtwagen / Pike Cars in the Fifties and Sixties that were formerly used in high quality express train service. The Der Eilzug train was particularly interesting for commuters, who streamed daily in and out of the large metropolitan areas. Many Eilzug runs were therefore done in the large metropolitan areas themselves on short routes and also in the surrounding areas on less frequented branch lines routes; the latter were popularly known as Heckeneilzuge / Hedge Fast Passenger Trains and had for all intents and purposes a long-distance service function. The modernization of the German railroad had no more use for the name Eilzug / Fast Passenger Train. The City Bahn / City Railroad, the Interregio or even more the Regional Express epitomizes best the task of the Eilzug / Fast Passenger Train of the past. 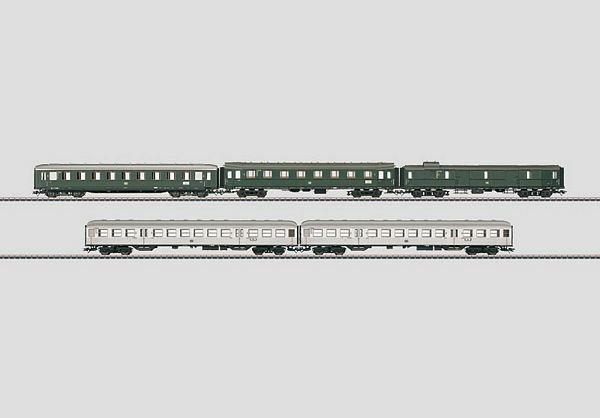 The German Federal Railroad class 39 is the right motive power for the E 554 Eilzug / Fast Passenger Train and can be found as an Insider model for 2009 in the Marklin H0 assortment under item no. 39390.